If you missed the episode of Prime Time with Taylor Baldwin in which she was pleasantly surprised at how delicious this green drink was, you can watch it here. Her reaction was classic! Obviously she liked the taste, but there was a fair amount of shock that is was so delicious. Here is the recipe for the green drink I call “The Bing”. It is named after our dear friend Bing who had nearly sworn off vegetables except potatoes. He fell in love with this version of liquid veggies. We honor him for taking a tasty step in the right direction. Juice all ingredients and enjoy. 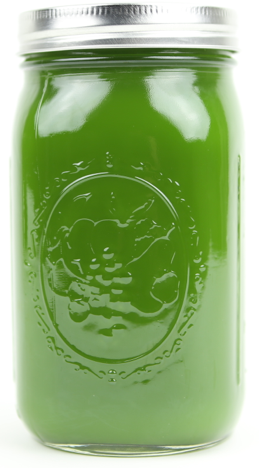 This juice has a particularly velvety smooth texture when juiced on the Norwalk Juicer. I made the drink with green apple, and it’s great! If I were to try making it with red grapes, how many would you recommend? The drink is fabulous! I made it for my boyfriend, my Son and the neighbors. Thank you! Glad they dig it Angie! Doesn’t it feel great to give the ones you love juices they enjoy, all the while knowing how good for them they are. I feel like I am sneaking them some health in a juicy disguise.